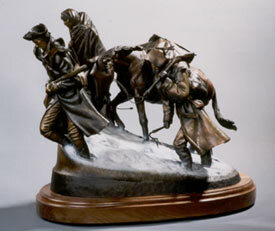 This bronze depicts Captain Lewis, Sacagawea, and Charbonneau as they struggle westward on the most desperate day. The worst day the expedition would experience, having been caught in a snowstorm on the Bitterroot Divide. With men and horses, in a near starvation state, turning back became as perlous as going forward, so westward they pressed, to finally reach the plains, weak but alive. It stands 19" tall and 22" long and weighs approximately 44 pounds. 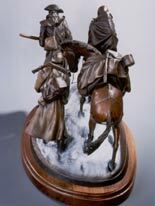 It is mounted on a fine quality 2" thick American walnut base. This is a limited edition of only 50 Please contact us for pricing. 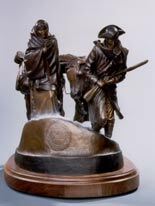 Bronzes are cast on an as ordered basis and you should allow 30 to 60 days for delivery. A 50% deposit is required. Shipping costs vary based on weight, distance and crate or box costs. We ship most bronzes in a plywood crate. You will be invoiced for the shipping charges prior to shipment. We charge you only actual shipping and packaging charges.